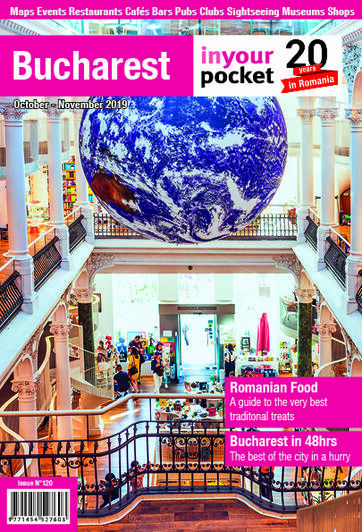 Should probably be the first stop on the food and drink list of any visitor to Bucharest. 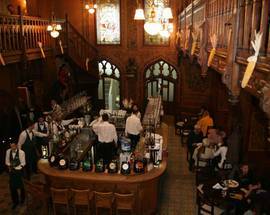 Wonderful interiors – painted ceilings, ornate woodwork – make the place an attraction in itself, but do not leave without trying some food. The breakfast is worth getting up early for, the sarmale with mamaliga terrific, and the baked apple a simple, tasty treat. They even serve their own rather good beer. The service is usually good (now: it never used to be; back in the 1980s and 1990s it was infamously bad) and there is a terrace in summer. We should also mention the touristy but nevertheless enjoyable impromptu folklore show which takes place most evenings. Note that the restaurant remains open, despite the restoration being carried out on the facade. Open 08:00 - 24:00, Fri, Sat 08:00 - 02:00. I am a customer who is difficult to please in a restaurant. However, I have always thought the CCB was a delightful place to eat. I have never had any reason to complain about their food! I would recommend them to anybody. BUT... they are popular and the staff work very hard, so do not be upset if the service is not fast! 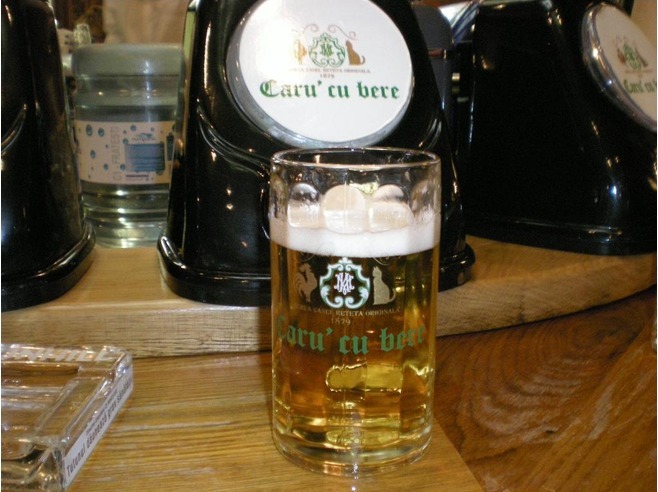 Whenever I am hungry or thirsty, I always head for the Caru Cu Bere. I am a very choosy eater because I am an excellent cook. Therefore, I will not eat rubbish! The food at CCB is superb! Acceptable table position, chosen by me, considering that all the other tables were unoccupied at that time. At the time of booking, I was warned that I could rent the table for a maximum of four hours although, I repeat, after arriving in the restaurant, there was no occupied table. I asked for a first floor table and I was told that the floor will be only open after 12:00, fact which was not communicated to me when I made the reservation. A waiter with a tablet came to the table and with a rather cathegorical voice and unjustified superiority to clients, said we did not have any choice ( for example, he told us he did not know what soup was available, that , however, the cook comes from 12:00, meaning that any soup served at 10:00 is not prepared by a chef, but heated). I ordered two plates and after an acceptable time we were brought. I found that the meat was hard as a stone, as if they were prepared for a few days and reheated, and the onion was of dark color and a doubtful taste. It is a pity that a place with a perfect location and a unique architecture in Romania can offer a submodest serving and a food under the value of a crack in Berceni. The emblem of the restaurants in Bucharest and the casting plate of Birlic and Giugaru is in great danger and must be saved! I&#39;m not going back to this location. A fantastic Place. The service was rather slow, waited more than half an hour for the main course and when it arrived it was Cold. The second beer I ordered never came. However it was lunch time and the restaurant was almost full. But serving Cold Food is not acceptable. However most probably I will be back to give them a second chance. just finished eating here&#045;&#045;service was awesome&#045;food was delicious and building itself is beautiful!! Never lets me down whwnever I bring guests here. Consistently brilliant. Poor service and cold food. It took 20 min to wait! Pricey for what it is. Vacamuuu is still the best. Best steak ever. Great and good service! I love Bucuresti. I visit regularly. 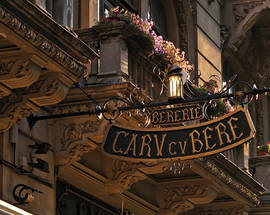 The "Caru cu bere" is undoubtedly the best restaurant in town. The food is properly cooked and reasonably priced. I have always found the staff and management are helpful cheerful and approachable... particularly the gorgeous young ladies! Food was great and cheap, the interior was very nice. The staff suffered from the condition the rest Bucharest's customer services do, that is: ignoring you, becoming annoyed when you ask for something, unable to smile and general unhelpful. Was also very smokey. 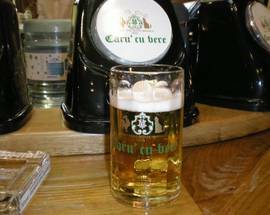 Went to Caru' cu Bere last week and really loved it!Amazing and fast service, great food, great beer and it cost me about $15 !!! The interior of this restaurant is in fact simply amazing ;)recommended! Wow! The improvements the new owners have made to Caru' cu Bere are amazing! It used to be the most horrible place, with dismal food and dismal Sovietski waiters, remarkable only for its proximity to CEC, Unirii, and The National History Museum. But now! It's bright, clean (even the ladies' room), with excellent food and service. There are actually things on the menu that you will want to order - - in fact, the menu is so large and appealing that it is difficult to choose. And everything delicious! There's live music even during the day, and the women servers/hostesses wear charming local costumes. A big, comfortable terrace has been added, and they have polished up the exquisite interior woodwork. Highly recommended to (and by!) both locals and tourists on all counts. We went for dinner here last night and it was great! There was a massive waiting list for tables, but we got seated within half an hour. Our waiter was really nice and helpful; food was delicious and a huge portion - we wanted to have dessert too, but literally had no room after our mains! It was crowded, and parts seemed very smoky, but maybe we were lucky with the location of our table. A great meal, which was inexpensive and very good quality - I'll definitely go back. We tried to have a meal here, but as soon as we enter the place, a fog of cigarette smoke hit us. The smoke was so thick you cut it with a stake knife. I decided to walk away and we went next door to Chocolat which we enjoy very much, especially the desserts. 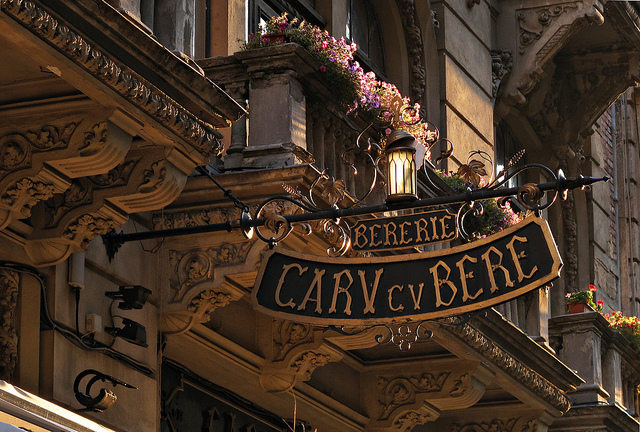 It was far the best restaurant in Bucharest .Fantastic ( and stunning ) atmosphere . It was like having a meal at Cardiff Castle !and as a bonus , the price was excelent !!! I would agree with what Alex says. It was the nicest restaurant we visited in Bucharest, but we did not venture beyond the Lipscani area for food, so we assume there are better places in Bucharest for food and service. Having said that we really enjoyed it. 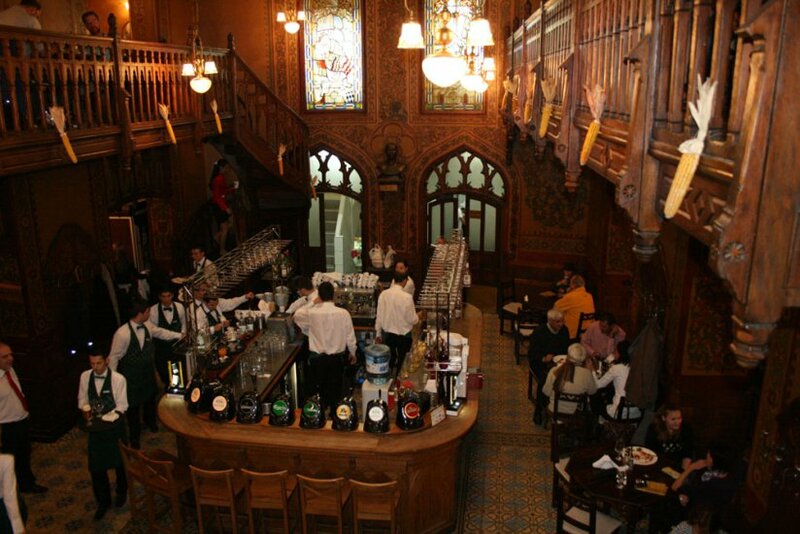 The interior architecture is fascinating and the food was good for basic goulash, sausage, and beer. We felt we saw something authentically Romanian although I am sure Kitty from Roma's head is about to explode and she will tell me thatta Ima just another ignoranta American! It's not worst than Hooters Hawaii (something traditional for Americans), Steak house Maui or Seattle, El torre Barcelona....first travel around the work and then...express yourself!!! The building is fine, service could be much better (just like at the uninspiring City Grill - which splat from La Mama anyway, wonder wonder), and the traditional restaurant show is one of the best in the city, including fine dances from various regions in the country. The drawback is that the non smoking area is actually the left side of the main hall (and smoke happens to travel from the smoking area to the non smoking area), most portions are rather small (especially starters), while the staff could use some changes here, there, everywhere. But then, not-so-good service is a part of the traditional restaurant concept in this part of the world. With (very little - and notable for that matter) exceptions.